Some 200,000 books, catalogues, periodicals, CDs, DVDs and other kinds of media on artists and themes related to the Kunsthalle are available to you. The emphasis is on the various fields of collection and research activities of the Hamburger Kunsthalle. This reference library is the most substantial art-historical specialist library in the North German region. Moreover, the library catalogue makes thematically relevant digital sources searchable. The collection of reproductions belongs to the special collections of the Hamburger Kunsthalle’s Library. Already Alfred Lichtwark had started collecting the new medium of reproduction photography. In this context, he purchased large portfolios and numerous individual photos. Gustav Pauli supplemented the collection with many valuable pieces and portfolios. He had also suggested to the Hamburger Kunsthalle to have reproduction photographs made of major works from the museum’s collection. Most of the individual photographs are of very high quality, originating from renowned photographers active in the early phase of the medium, as for example from Adolphe Braun’s studio in the Alsace or the Alinari brothers from Florence. Lichtwark and Pauli had used the reproductions for presenting comparative images during their lectures, events and guided tours. After the introduction of slides as a media, the reproductions collection received less attention. Today the old photographs are highly valued as historically relevant. Besides this, the reproductions collection features several special departments directly connected to the art collection of the Hamburger Kunsthalle. These include pictures of restoration work and materials for the production of exhibition catalogues (mainly from the period under the direction of Werner Hofmann). This finding aid is the first comprehensive indexing of the collection. It renders the captions of the archive folders and boxes, which allows you to get an overview of the available material and become familiar with the focus areas of the holdings. - Orient. Ägypten, altchristl. und byzantin. - Anonym – XVI. Jh. - Anonym – XVII.-XIX. Jh. - Cranach d.Ä. + Cranach d.J. - Anonym o.J. – XIV.-XVI. - Anonym – XVIII.-XIX. Jh. - Anonym XIV. + XV. Jh. - Anonym XVI. + XVII. Jh. - Anonym 15. + 16. Jh. - Teniers d.Ä. und d.J. - Anonym XIV. und XV. Jh. Denkmäler griechischer und römischer Sculptur / Heinrich von Brunn, Paul Arndt. - Kunst – was ist das? The press archive belongs to the special collections of the library. It compiles newspaper and periodical clippings about the Hamburger Kunsthalle. Press coverage on the Hamburger Kunsthalle’s exhibitions is particularly extensive. The press archive contains articles on more than 800 exhibitions. They are kept in separate folders for each exhibition. When there are only a few clippings, they are filed chronologically in shared folders comprising several exhibitions. This finding aid is the first index for the press archive of articles related to our exhibitions. It lists the exhibitions in chronological order, indicates the title of the exhibition and states whether there is a separate press folder (PM) or press articles in a shared folder (PA). The finding aid thus also provides a convenient overview of most of the exhibitions of the Hamburger Kunsthalle. The holding’s earliest newspaper articles date back to 1921. In the early years, the period of the exhibitions is not always fully known, however, the finding aid lists the dates as precisely as possible. The capturing of exhibition dates in published media improved only in the late 50s of the twentieth century. Up to 2012 the Hamburger Kunsthalle had commissioned a press clipping service, which provided hard copies of all press articles. Since 2013 this clipping service has been delivered electronically. For copyright reasons an archiving function is therefore no longer given, as one can only obtain a reading license for a certain period and a limited number of study desks. This is why only few articles have since entered the press archive of the special collections. We therefore have discontinued the full documentation of the Hamburger Kunsthalle’s activities for future generations. Claus Böhmler. Ablichtungen vom Story-Board "Zum Eichhorn" und "Kommt, zirkelt, sägt und ploppt"
Surreale Welten. Von Piranesi bis Dubuffet. Meisterwerke aus einer Privatsammlung Kubin, Ernst, Dali, Magritte, Klee u.a. Sigmar Polke – Wir Kleinbürger! Zeitgenossen und Zeitgenossinnen. The Press Archive belongs to the special collections of the Hamburger Kunsthalle’s Library. The section for news releases compiles interesting and relevant press articles on general themes, on the museum itself and on artists from the art collection of the Hamburger Kunsthalle. The keyword index lists all keywords by means of which one can find a folder with press articles. 1) DAAD (Berlin) 2) D…..
Hamburg : Kunsthalle : Kronprinzenpaar zu Gast in HK (Dänen) s. Pressemappe Ausst. - 1. Veranstaltung 2004 (6.2.04) s. Schuber HH : HK : neue Ansichten f. HH. Hamburg : Kunstpreise s. Kunstpreise allgem. Lesung “Die Deutschstunde” mit Siegfried Lenz am 9.11.2006 s. HH : Kunsthalle : allgem. Nürnberg : Kunst (und) Politik. Stefano della Bella. Della bella linea. Tagung am Warburg-Haus, Hamburg, 9.-10. Juli 2009 s.
The library team will be pleased to answer your questions on how to use the library and the catalogue, on the library collection and on particular artists and art-related topics. Call us, write us a letter, an e-mail or fill in the information sheet. You may access the library holdings on site, in the reading room. Materials from the special collections and book art will be displayed on request, during the hours scheduled for their presentation. Would you like to be informed on the latest news and stay up to date on interesting themes from the library? Then please subscribe to our monthly newsletter WissensWert (in German). Which media will you find in the library? The section for book art comprises illustrated books from the 13th to the 21st century and Artists’ books from the 20th and the 21st century. Which media formats are available in the library? The library is not limited to a particular kind of media. The holdings mainly comprise books and periodicals, but also single documents, small brochures, CDs, DVDs, videos, records, cassettes and various electronic media. Are there any digital holdings? The original illustrations contained in the books from the field of book art are currently being digitalised and made accessible. They can be searched via the collection database of the Hamburger Kunsthalle. Please find the digital copies via the library catalogue of the Hamburger Kunsthalle. How old is the collection? Most items are from the 20th century. The old collection from the 16th – 19th century comprises around 8,000 items. In the field of book art, the library owns 48 incunabula. These may also be searched in the Incunabula Short Title Catalogue of the British Library or via the Inkunabelkatalog INKA of the University Library of Tübingen. The library’s growth, achieved through gifts, the exchange of publications, acquisitions and specimen copies, amounts to approx. 2,500 media items annually, One third of the annual acquisitions consists of artists’ monographs, catalogues raisonnés and art-historical literature. Two thirds of the new arrivals are exhibition and collection catalogues. The library holds 247 subscriptions of periodicals. We collect specialist literature in all languages. The major part of the media, however, is in German or English. The library is accessible to the public and may be used by anyone interested. Can the media be borrowed? No, the library is a reference library. The holdings may be viewed in the reading room during opening hours. Is it possible to establish a reference collection? Those who frequently visit the library and want to repeatedly access the same media, have the possibility of establishing their own reference books in the reading room. Please address one of the librarians to learn more. Can I bring my laptop with me? Yes, you can. There are plenty of sockets for laptops in the reading room. It is allowed to copy, photograph or scan the media? The library staff will make up to 10 black-and-white photocopies with a book copying machine for you, if the state of preservation and the material of the items allows it. One copy costs € 0.25–0.50. In this context, the provisions of copyright law are to be observed. Illustrated books and artists’ books and items from the special collections cannot be copied for conservational reasons. Taking photos without a flash is allowed. Again, the provisions of copyright law are to be observed. The library has a tripod for your camera. Please do not hesitate to address the library staff members. Bringing a scanner is not permitted for conservational reasons. It is currently also not possible to scan media in the reading room. The library of the Hamburg Kunsthalle was founded in 1863 and opened to the public in 1869. At that time, it functioned as a reference library for the painting gallery, the print cabinet and the sculpture collection. The stock consisted of general and specialist reference works, language dictionaries, bibliographies and handbooks. Indeed, that range is still available. The basis for the library was part of the private library of Georg Ernst Harzen (1790-1863), a Hamburg art dealer and collector. In 1891 the reading room was opened in the old building of the museum, and as a result the library became accessible to the public. From the outset, the room was intended to cater both for the library, and the prints cabinet. The library took its lead from the work of the Museum. The aim was the creation of a specialist art library for north Germany. To that end, it began to acquire important reference works and monographs. In 1889 the library obtained a collection of Ludwig Richter's work from the Richter-specialist Johann-Friedrich Hoff. With 134 volumes, it now possesses an almost complete collection of illustrated works by Ludwig Richter. In addition, they acquired art-historical journals. The historical collection includes 165 periodicals, nine from the eighteenth century, and has been increased through donations and legacies. In 1895, 410 exhibition catalogues were donated to the library by Cipriano Francisco Gaedechens, an independent scholar of Hamburg, and contemporary of Harzen. To begin with, the library's acquisitions rate was between 200 and 300 volumes a year. In the early twentieth century, this number increased to 800-900 volumes. 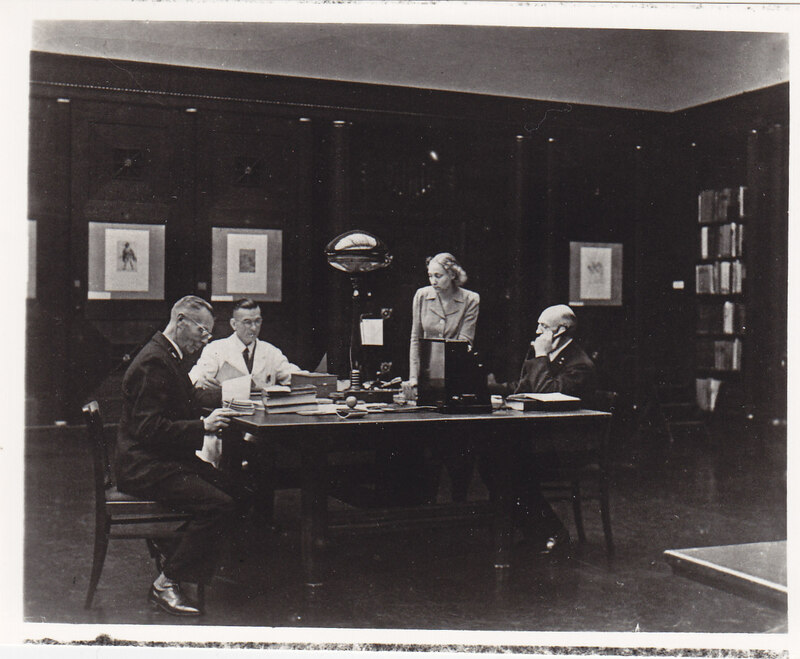 In 1922, the reading room was moved to the new wing of the old building of the Kunsthalle. The furnishings, now preserved under the historic monuments scheme, were designed by Fritz Schumacher. During the transfer to the new wing, the library was completely reorganised. In 1925, the library acquired the stock of the University Department of Art-History, together with the greater part of the library of August Kalkmanns, a classical scholar and friend of Aby Warburg. However, the stock of the Kunsthalle remains separate from that of the Department of Art-History, whose strength lies in architecture. 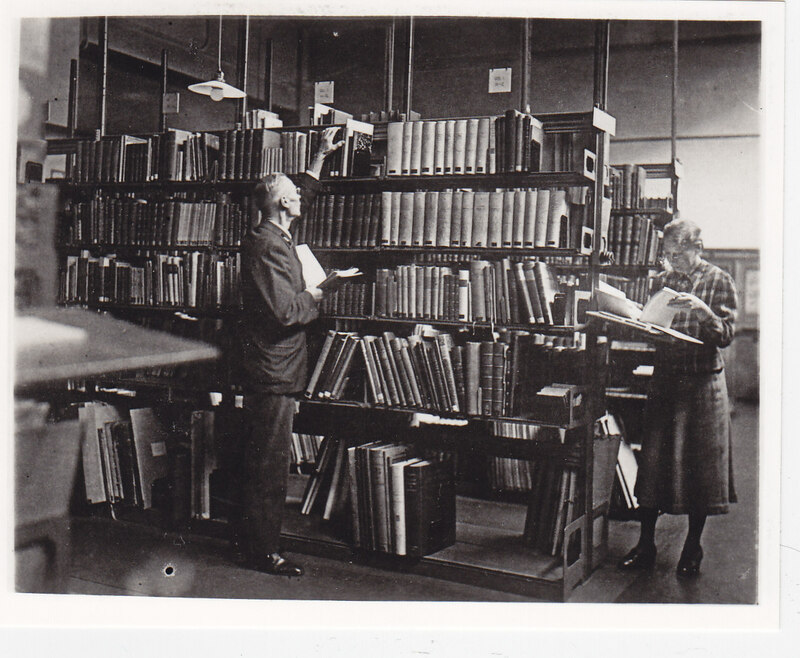 During the period of National Socialism, government funding was reduced to a minimum, so the library's stock grew mostly through donations. During World War II part of the stock was evacuated, but already in the Autumn of 1945 the library was moved back into the Kunsthalle. Part of the stock was, however, lost or damaged. Since then the library has grown to more than 165 000 publications. On request we offer to groups guided tours through the library collection, introductions to the use of the library and events on information literacy in the field of art and art history. Specific guided tours and events of the library are featured in the calendar.